What Role for Natural Gas in Transportation? Will natural gas ever catch on as an important transportation fuel? As you would expect, the biggest potential savings accrue to the most fuel-guzzling vehicles, heavy-duty trucks in particular. Technological advances in horizontal drilling deep underground have led to large-scale discoveries of natural gas reserves that are now economical to access. This, along with increases in oil prices, has fundamentally changed the relative price of oil and natural gas in the United States. As of December 2011, oil was trading at a 500 percent premium over natural gas. This ratio has a number of policy goals related to energy. Natural gas can replace oil in transportation through a number of channels. However, the field between natural gas as a transportation fuel and petroleum-based fuels is not level. Given this uneven playing field, left to its own devices, the market is unlikely to lead to an efficient mix of petroleum- and natural gas-based fuels. This paper presents a pair of policy proposals designed to increase the nation’s energy security, decrease the susceptibility of the U.S. economy to recessions caused by oil-price shocks, and reduce greenhouse gas emissions and other pollutants. First, I propose improving the natural gas fueling infrastructure in homes, at local distribution companies, and along long-haul trucking routes. Second, I offer steps to promote the use of natural gas vehicles and fuels. His “steps to promote the use of natural gas vehicles and fuels” are subsidies and regulations. Regular readers will recall that I believe environmental taxes would be a better way of addressing environmental concerns and, in particular, of promoting natural gas over gasoline. Of course, that view hasn’t gained much traction among policymakers. As least not yet. 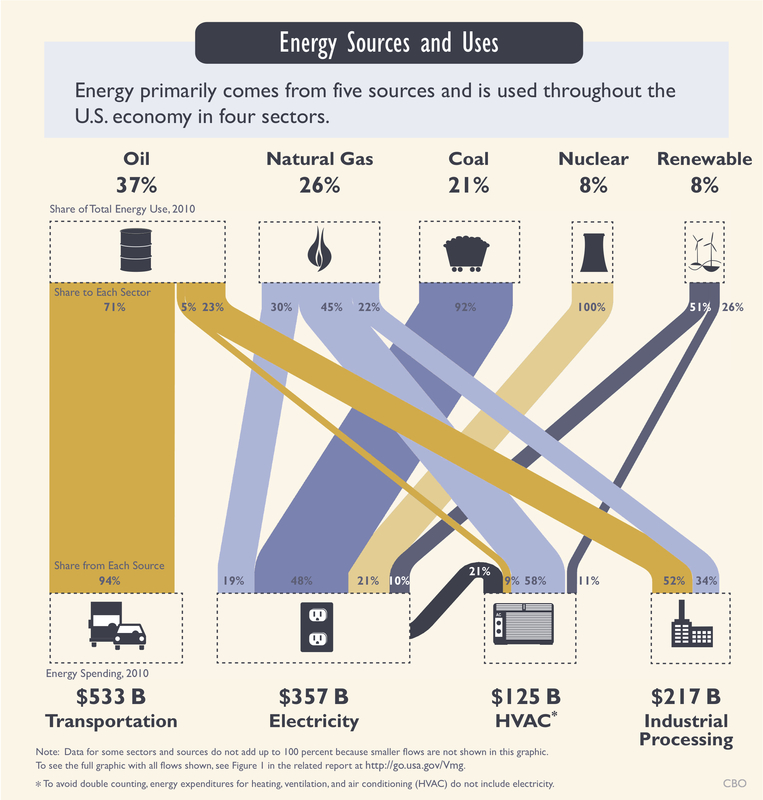 The Congressional Budget Office is out with another fine infographic, this time on energy security. One of the most notable features is the absence of any link from natural gas to transportation (some natural gas is used in transportation, of course, but not enough to make the cut for this image). Given the ever-growing divergence between oil and natural gas prices, I wonder whether that will still be true a decade from now? Or will someone finally crack the natural gas to transportation fuel market in a big way? With abundant new supplies of gas making it the cheapest option for new power generation, the largest U.S. wind-energy producer, NextEra Energy Inc. (NEE), has shelved plans for new U.S. wind projects next year and Exelon Corp. (EXC) called off plans to expand two nuclear plants. Michigan utility CMS Energy Corp. (CMS) canceled a $2 billion coal plant after deciding it wasn’t financially viable in a time of “low natural-gas prices linked to expanded shale-gas supplies,” according to a company statement. Mirroring the gas market, wholesale electricity prices have dropped more than 50 percent on average since 2008, and about 10 percent during the fourth quarter of 2011, according to a Jan. 11 research report by Aneesh Prabhu, a New York-based credit analyst with Standard & Poor’s Financial Services LLC. Prices in the west hub of PJM Interconnection LLC, the largest wholesale market in the U.S., declined to about $39 per megawatt hour by December 2011 from $87 in the first quarter of 2008. Power producers’ profits are deflated by cheap gas because electricity pricing historically has been linked to the gas market. As profit margins shrink from falling prices, more generators are expected to postpone or abandon coal, nuclear and wind projects, decisions that may slow the shift to cleaner forms of energy and shape the industry for decades to come, Mark Pruitt, a Chicago-based independent industry consultant, said in a telephone interview. 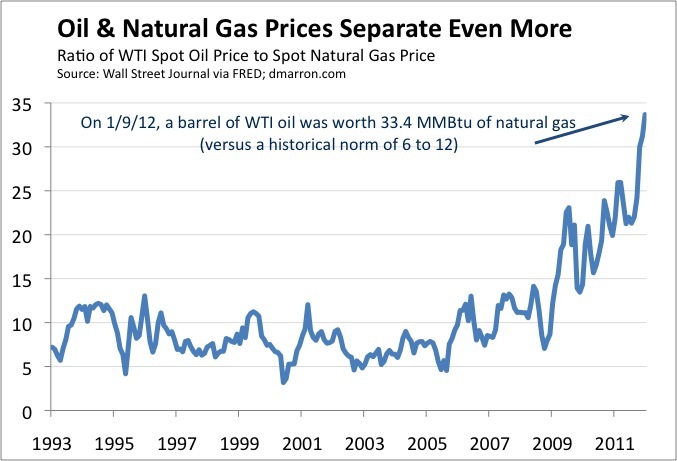 In 2010, I wrote a series of posts documenting how oil and natural prices had decoupled from each other (see here and here). For many years, oil prices (as measured in $ per barrel) were typically 6 to 12 times natural gas prices (as measured in $ per MMBtu). That ratio blew out to around 20 in 2009 and again in 2010, a severe break with historical trends. A barrel of oil has roughly 6 times the energy content of a MMBtu of natural gas. If the fuels were perfect substitutes, oil prices would thus tend to be about 6 times natural gas prices. In practice, however, the ease of using oil for making gasoline means that oil is more valuable. So oil has usually traded higher. But the current ratio is unprecedented. Each Btu of oil is now worth about five times as much as each Btu of natural gas. Thanks to a torrent of new supply, natural gas prices are down at $3.00 per MMBtu even as oil (as measured by the WTI price) has risen back above the $100 per barrel mark. Perhaps natural gas vehicles will be the wave of the future? Note: Energy price aficionados will note that I’ve used the WTI price in these calculations. That used to be straightforward and unobjectionable. Now, however, we have to worry about another pricing discrepancy: WTI is very cheap relative to similar grades of oil on the world market (for background, see this post). For example, Brent crude closed Monday around $112 per barrel, well above the $101 WTI price. Brent prices are relevant to many U.S. oil consumers. There’s a good argument, therefore, that my chart understates how much the price ratio has moved. Can Natural Gas Replace Oil for Diesel? In a series of posts (most recent here), I’ve noted that oil and natural gas prices have become unhinged from each other. Oil (denominated in $ per barrel) used to trade at 6 to 12 times the price of natural gas (denominated in $ per MMBtu). But lately that ratio has been north of 20, thanks to a surfeit of new gas in the United States (and elsewhere) and, recently, growing global demand for oil. The wide spread between oil and natural gas prices provides a tempting incentive for any innovators who can figure out how to use natural gas, rather than oil, to make transportation fuels. Diesel and jet fuel are usually made from crude oil. But with oil prices rising even as a glut of natural gas keeps prices for that fuel extraordinarily cheap, a bit of expensive alchemy is suddenly starting to look financially appealing: turning natural gas into liquid fuels. A South African firm, Sasol, announced Monday that it would spend just over 1 billion Canadian dollars to buy a half-interest in a Canadian shale gas field, so it can explore turning natural gas into diesel and other liquids. Sasol’s proprietary conversion technology was developed decades ago to help the apartheid government of South Africa survive an international oil embargo, and it is a refinement of the ones used by the Germans to make fuel for the Wehrmacht during World War II. The technology takes “a lot of money and a lot of effort,” said Michael E. Webber, associate director of the Center for International Energy Environmental Policy at the University of Texas, Austin. “You wouldn’t do this if you could find easy oil,” he said. The unusual pricing of the last two years reflects two factors. First, there has been a dramatic–and welcome–expansion in domestic natural gas supplies. That’s driven natural gas prices down to less than $4 per MMBtu at yesterday’s close. Second, there is limited opportunity for energy users–utilities, businesses, and homeowners–to switch from oil to natural gas. 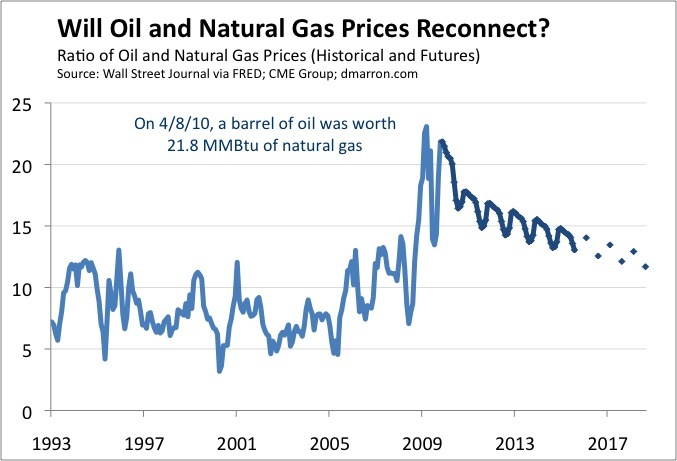 Years ago, such switching linked oil and natural gas prices relatively closely. But today those prices appear largely decoupled. All of which poses an important question for investors, forecasters, and industry planners: Will historical relationships eventually reassert themselves, perhaps by longer-term fuel switching by utilities and transportation fleets to natural gas? 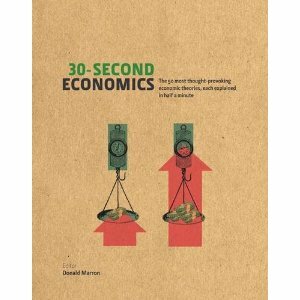 Or is this time really different, with old pricing relationships no longer relevant? One way to answer that question–or, at least, to get some insight into how others are answering it–is to look at futures prices. As illustrated in dark blue above, those prices imply that the ratio of oil to natural gas prices will remain well above historical levels for at least the next eight years. The new normal, according to futures markets, will be for oil prices to average about 15 times natural gas prices. My recent post about oil and natural gas prices elicited some very constructive responses from readers (thanks in particular to PJ, MF, and FW, in addition to public commenters on the post). As a result, I’ve rethought my discussion of the relationship between oil and natural gas prices. As noted in my earlier posts, oil and natural prices appear to have disconnected from their historical relationship. For many years, oil prices (as measured in $ per barrel) tended to be 6 to 12 times natural gas prices (as measured in $ per MMBtu). That ratio blew out to more than 20 in late 2009, then receded to more traditional levels, and then blew out again in recent months. At yesterday’s close, the ratio stood at 21.8, far above its historical range. In my previous posts, I argued that this unusual pricing reflects the sudden (and welcome) increase in natural gas supplies and that we should expect oil and natural gas prices to eventually move back toward their historical relationship as markets absorb the new gas. Of course, I was careful not to say when this would happen. Good Old Days: For many years, the electric utility industry had generating plants that ran on oil, natural gas, or both. The ability to fuel switch (either by changing the dispatch order of oil and gas plants or changing fuels at plants that could use either) limited how much oil and natural gas prices could deviate. If oil prices fell too low, utilities would move from natural gas to oil, and vice-versa. Similar fuel arbitrage occurred, to varying degrees, among other uses as well (e.g., home heating and some industrial uses). More Recent Days: In recent decades, electric utilities have embraced natural gas and moved away from oil. As a result, there is much less opportunity for arbitrage between the fuels. The same has happened among other fuel consumers as well. Oil and natural gas prices nonetheless remained within their usual historical relationship. For example, oil and natural gas prices rose and fell in tandem during 2008. This suggests that the markets encountered similar shocks during those years (e.g., strong demand or, some would argue, speculation), not that they were linked via arbitrage. Today: With the decline of traditional fuel arbitrage possibilities, oil and natural gas prices can now move separately if they experience distinct shocks. That appears to have happened with the increase in natural gas supply, for example. Future: Looking further ahead, however, one would expect some new arbitrage relationships to develop. If we have persistently cheap natural gas and persistently expensive oil, that creates an incentive for ingenious folks to find ways to use natural gas to serve what have traditionally been oil demands. That should eventually limit the degree to which the prices can deviate (although not necessarily in the 6 to 12 ratio range). Two leading candidates for this linkage are using natural gas as a transportation fuel (directly as a fuel and perhaps indirectly as electricity) and increased international trade in liquified natural gas. Note: The chart uses the spot price for West Texas Intermediate at Cushing and the spot price for natural gas at Henry Hub on a monthly basis through March 2010. For April 2010, I use the closing prices on April 8. The monthly futures are from the CME Group.